Clearly, I love eggs. In fact, eggs are one of the most tagged items on this blog. I love eggs almost as much as I love potatoes and noodles. And, depending on my mood, maybe even a little more so because they’re kind of sort of good for you. Protein packed and in their own convenient little eco-friendly packaging (shell), eggs are nature’s perfect food. I know science goes between saying that eggs are good/bad for you, but I figure, everything in moderation is always a good thing. Of course, if you’re going to have eggs, you should have bacon. 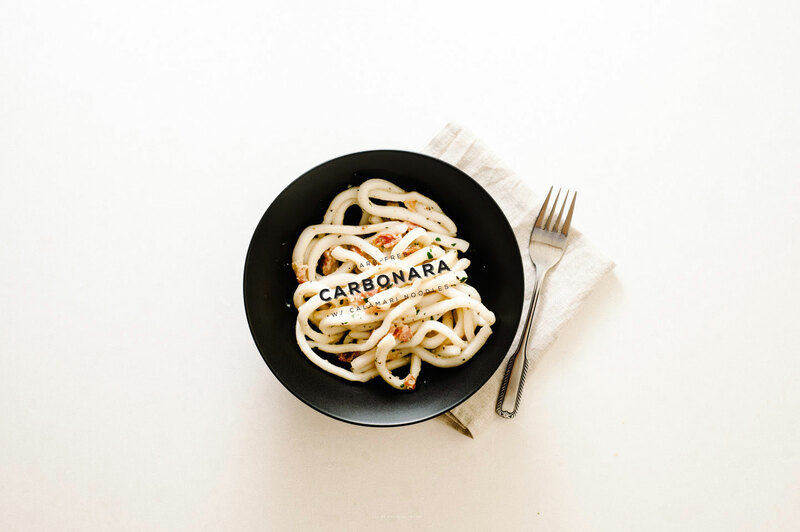 And if you’re going to have eggs and bacon, why not make yourself some carbonara? Carbonara is everything good in life – crispy pork bits and creamy, cheesy, eggy sauce. The first time I made carbonara, I scrambled the eggs accidentally. It still tasted good, but it wasn’t that silky sauce that you’re looking for. The key, I’ve found, is adding in a touch of starchy pasta water. Then again, this recipe doesn’t even have pasta in it, so you don’t need to worry about that. I love a big plate of pasta as much as everyone else, but one day, when I was cleaning out the freezer I found a long forgotten bag of frozen calamari tubes. I was going to go to town and deep fry them, but instead decided to cut them into noodle-y slivers and carbonara them up. I got the idea from Pidgin, a fantastic casual fine dining place in Vancouver. They do a super delicious squid noodle yakisoba. This dish is totally carb and gluten free, but the best part is that it’s incredibly delicious. I definitely recommend cutting the calamari a bit thinner for a more refined looking plate. Otherwise, if you’re just looking for a quick, but different down home kind of carbonara, give this a try! Cut the calamari tubes into noodles. I sliced them into 1/4 inch rings (try 1/8 inch) and then made a cut in the rings so they turned into ribbons of calamari. If you prefer, you can slice them lengthwise, so you don’t have to make two cuts. Set the “noodles” aside in a bowl. Bring a pot of water to boil and keep it on a low simmer. 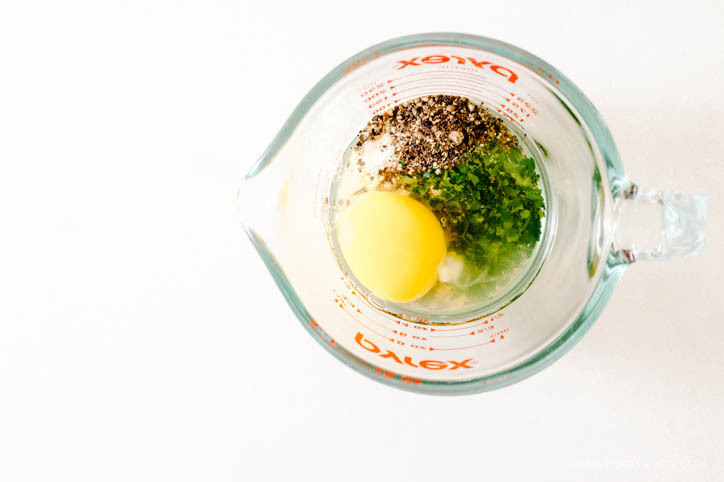 In a glass measuring cup or small bowl, lightly beat the egg, add the cheese, a liberal grinding of pepper, and the chopped parsley. Mix thoroughly and set aside. In large sauté pan over medium heat, fry the bacon pieces until crispy. Leave the bacon in the pan and scoop off the rendered fat, leaving about a tablespoon left in the pan. Remove from the heat. 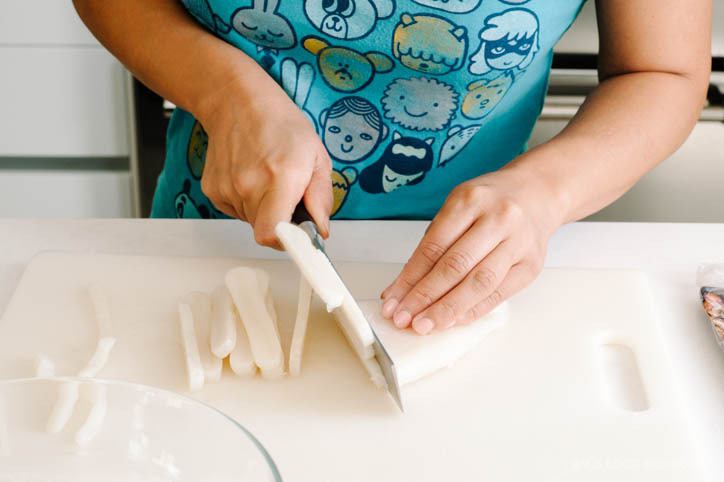 Quickly blanch the calamari noodles, about 30-45 seconds. When cooked, the calamari looses it’s transparency and turns opaque. Drain, making sure to save some of the calamari liquid and then add the cooked calamari to the sauté pan. 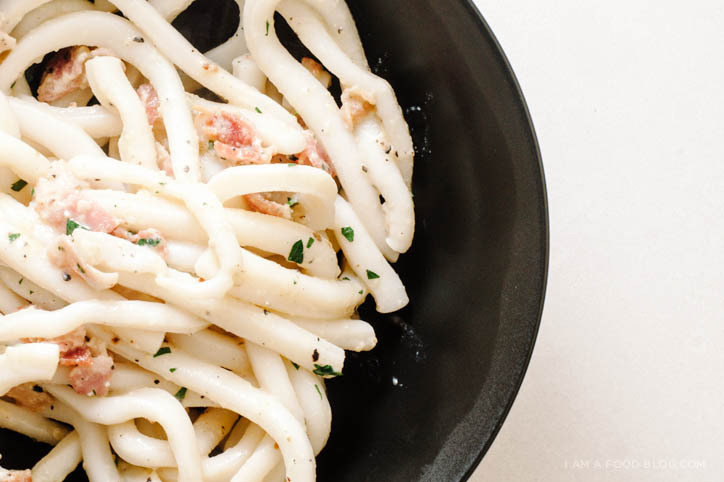 Turn the heat on low – generally, when making carbonara, you don’t need to turn the heat on again, but since the calamari noodles lose heat more quickly than pasta, a low heat is needed to help the sauce come together. Toss to coat each strand of calamari in the bacon fat. Pour in the egg mixture and toss rapidly, coating well. If needed, add a bit of hot reserved water, 1 tablespoon at a time, to help melt the cheese and cook the egg. Serve immediately. I AM ALL OVER THIS, Steph. Holyyy moly. 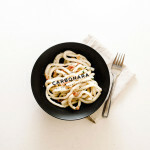 I adore carbonara, but can never justify making it for dinner because of its sheer carbstrosity-ness. And I can never really get on the vegetable-noodle train. But squid? I am all about that squid. This is so genius. Can’t wait to try it. Such a great idea!!! Love this. I love this!! 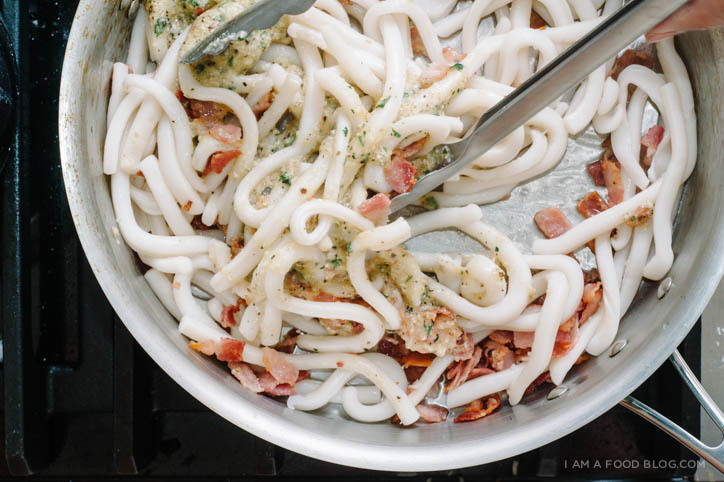 The idea of squid as noodles sounds like an incredible combination of texture and flavors.. Thanks Erika! I love the slight chewiness of squid as noodles. Sounds so ono (delicious)! I’m going to make some right now. Thank you! Ok…..I just found your blog. I think I love you. Just found the blog too. LOVE IT!!!!!! 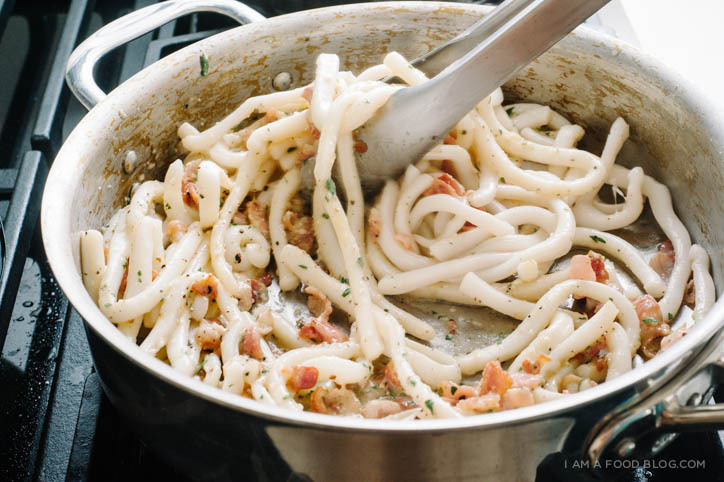 ..Squid carbonara…..oy Vay ! A cookbook to boot……..life is good. What an awesome recipe! What squid do you suggest purchasing? The thawed squid in the seafood counter are always so small and thin (and definitely don’t look as thick as the ones you used in the recipe). Are frozen squid typically thicker?